As you may have heard we now have a dedicated project manager for the SRN4 project. His name is Steve McGarry and he’s the go-to guy for all things SRN4 at the museum. Now that we have undergone a planning and evaluation process we are ready to propel the SRN4 restoration project forward. As part of this, we need as many hands as we can muster. 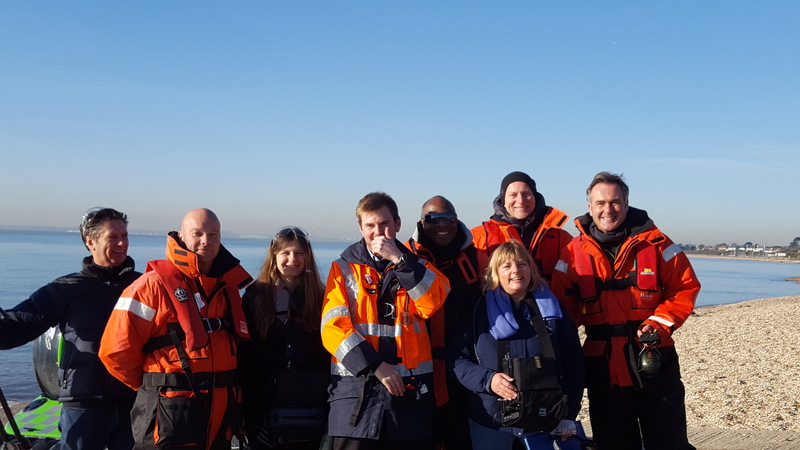 If you have an interest in becoming a volunteer helping on this project (or just helping at the museum in any capacity) please visit our website at www.hovercraft-museum.org/volunteer for more information on how to get involved! 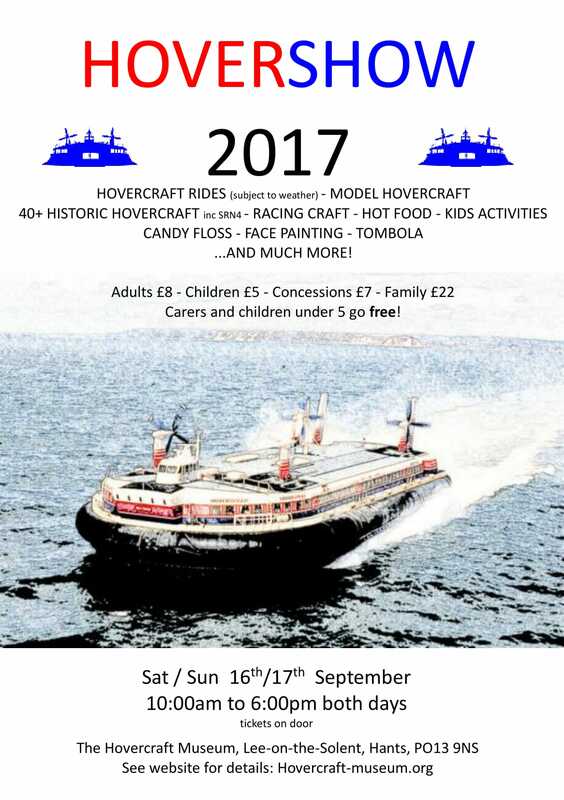 If you have any questions please feel free to contact us through the website “Contact Us” page or enquiries@hovercraft-museum. org. Fix up the “Skirters” box (used by the skirt technicians to repair skirts while in service) so that it can be moved to the front of the craft to be used as a display exhibit. Clean and illuminate the lift ducts, and install a Perspex door to show off the pivotal piece of technology that makes hovercraft work – the lift fans! We hope to see you at the museum soon! Posted on 4th March 2017 under in Uncategorised | By Alex. 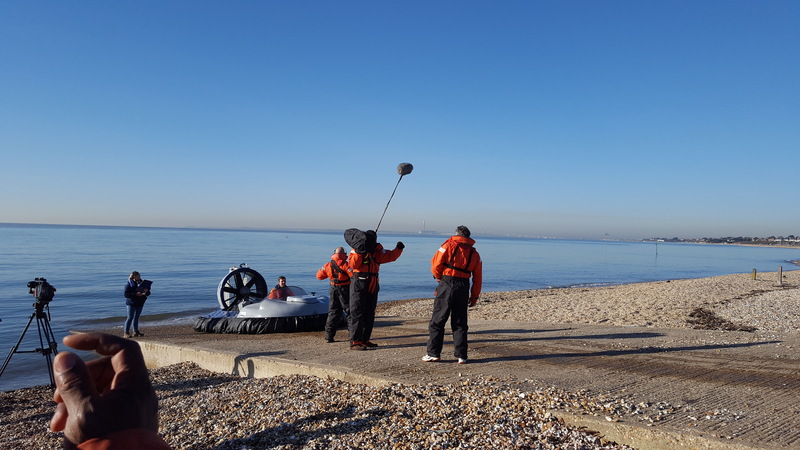 A successful day of filming at the museum has concluded today after a production crew visited the Hovercraft Museum today to film for The BBC’s Flog It programme. We couldn’t have asked for better weather for filming, albeit a tad on the cold side. 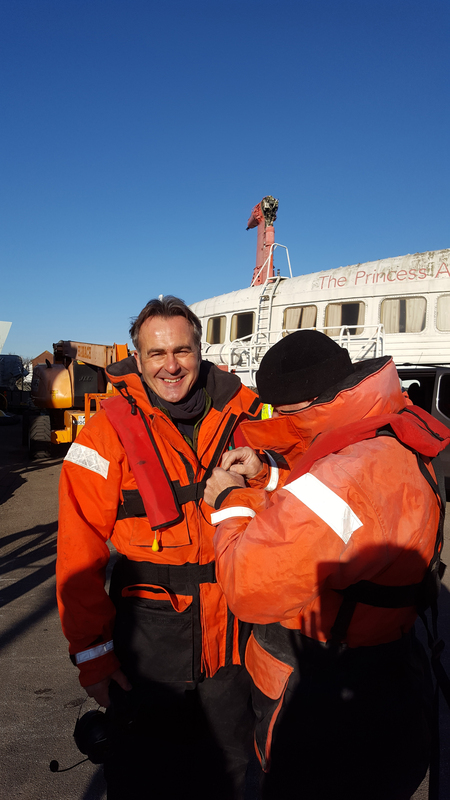 We even got the presenter Paul Martin out on a hovercraft. He really enjoyed the flight and said if he lived near the coast he might buy one. We definitely did attract some attention at the slipway with both hovercraft, AND TV cameras – it’s always great to see people taking an interest in such a unique mode of transport. 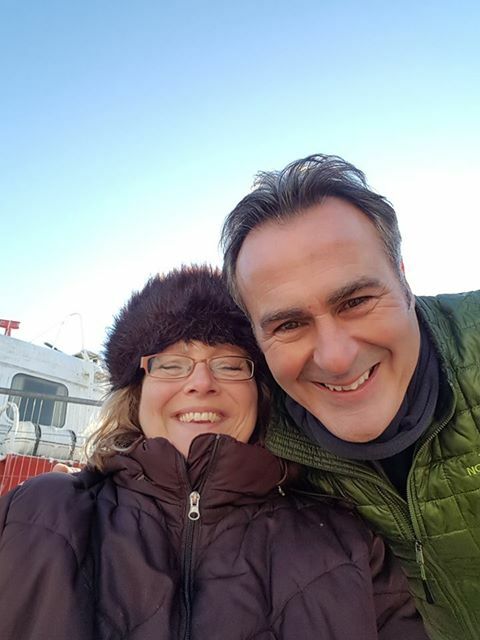 The episode of Flog It featuring the museum will be released in the new year and we’ll put out an announcement nearer the time when we know the air date so you can watch at home! Posted on 30th November 2016 under in Uncategorised | By Alex. Warwick (left) being presented with the Engineering Award for the SRN5 restoration. 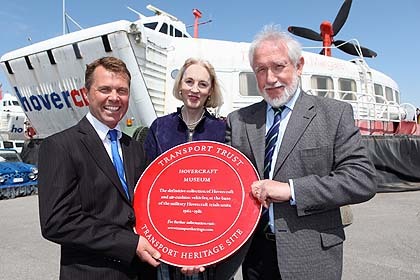 After an eventful 30 years with the Hovercraft Museum, our longest running trustee, Warwick Jacobs, has decided to step back from his role as trustee. After devoting such a long period to the museum to make it what it is today he has decided that now is a perfect time to pass the torch on. While still being involved with the museum, hopefully for another 30+ years, he aims to take some time to focus on his art career (see some of his art here) and fulfilling his dream to relocate to France with his partner. Many people know Warwick “as the museum”, which is no small part down to his exceptional job as a PR/Spokesman, representing us in the local community, news articles and reports, numerous hovercraft productions and even national television! However, this is only the public side of what Warwick has done. 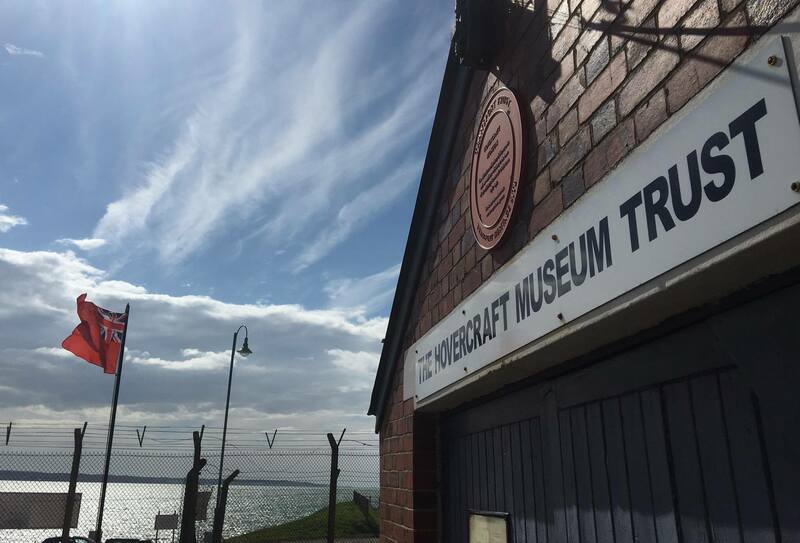 Back in 1986, along with members of the Hovercraft Society Council, a subcommittee was set up to investigate the creation of a designated hovercraft museum. In 1987 Charitable status was applied for, and granted in 1988. Twenty-five trustees and six landlords later, the Museum now has a large site with an SRN4, BH7, and many other important craft. In the last year, the museum has been able to open all year round, welcoming over 5000 visitors from all around the world, including people from Germany, France, America, Canada, The Netherlands, and Belgium! 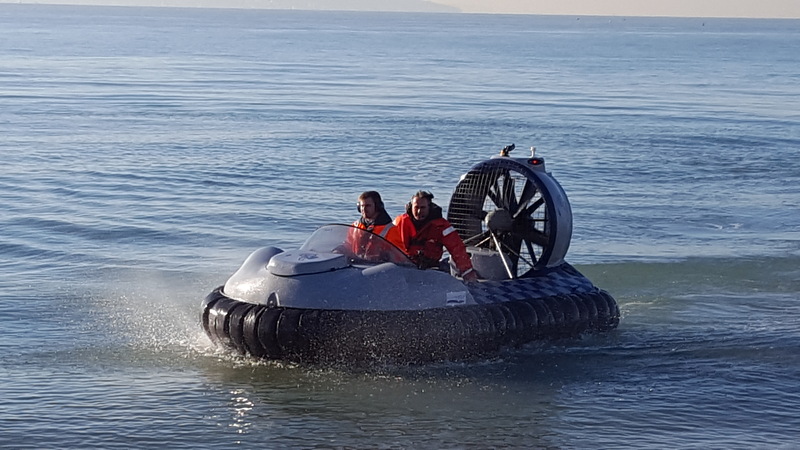 With this brilliant surge of interest in Hovercraft, the museum membership has grown vastly with a fresh influx of eager volunteers that work hard every weekend to restore and maintain a growing collection of craft. Warwick has overseen some truly great museum achievements over the years, such as seeing Sir Christopher Cockerell take control of a hovercraft on his 80th birthday flypast, receiving a Transport Trust Award for the restoration of our SRN5, winning our hangars listed status and even bringing, not one, not two, but three SRN4 craft onto the site over the last few years! The campaign to save The Princess Anne was an extremely successful one, collecting over 22,000 signatures and successfully stopping the scrap men from destroying a unique piece of British engineering heritage. We hope you will join us in giving Warwick a massive thank you for his service and congratulating him on his achievements! Posted on 18th November 2016 under in Uncategorised | By Alex.